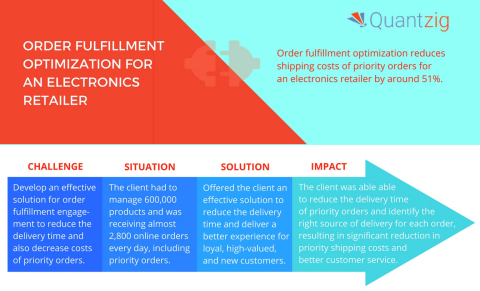 LONDON--(BUSINESS WIRE)--Global analytics and advisory firm Quantzig recently collaborated with a leading online electronics retailer in Australia and New Zealand to develop an effective solution for order fulfilment optimization. The project allowed the client to reduce delivery times and decrease the cost of priority orders. Organizations, especially in e-commerce, have a number of challenges to overcome while optimizing their order fulfillment processes. While there is an increasing preference for e-commerce driving online business, consumers are also demanding fast, affordable shipping, which is challenging for companies to provide without excessive cost. As competition in the market intensifies, the quality of a merchant’s deliveries can mean the difference between success and failure. Quantzig’s latest project helped the client develop a store-to-door model that would allow the company to fulfill online deliveries much faster. By analyzing historical sales data and segmenting order history, the analysts at Quantzig helped the client rationalize the shipping cost by identifying the priority orders to be delivered from the stores. By developing a random forest decision tree-based approach, this order fulfillment optimization solution also helped the client identify the influencing factors for customer ratings in each segment and approximated a cost function to recognize the right store to fulfill the order. With customer needs and shopping behaviors changing rapidly, it becomes imperative for the retail and consumer packaged goods (CPG) industries to develop customer-centric solutions and experiences and drive business outcomes. Quantzig’s portfolio of retail and CPG analytics solutions uses predictive and prescriptive analytics to help companies with critical decision making around pricing strategies, product promotion, sales and demand forecasting, and merchandising planning. Request a free proposal to see how Quantzig’s solutions can help you. Quantzig’s latest project optimizes order fulfillment for top electronics retailer.